Cell culture, the cultivation of cells isolated from live tissue in vitro (in the test tube), is an acknowledged and valuable tool in biomedical research for the acquisition of reproducible data. In addition, highly effective substances are produced in large-scale for medicine or biopharmaceutical and academic research by means of cell cultures to an ever increasing degree (e.g. insulin, growth factors, monoclonal antibodies, or clotting factors). Cell cultures in vitro need nutrient solutions, so-called media, which provide a simulation as close as possible of the in vivo situation (in live organism). 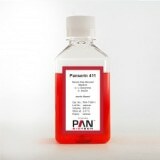 For this purpose these cell culture media – mixtures of nutrients, salts, trace elements, buffers, growth factors, protective binding and transport proteins and many additional components – have to be supplemented by a most natural, highly complex additive mixture. For many years, animal derived and also human sera were the means of choice for production related reasons as well as for a lack of alternatives in more defined cell culture nutrients. Serum proteins bind toxic substances and stabilize sensitive growth factors However, the use of serum in cell cultures, usually fetal bovine serum (FBS), is problematic for several reasons. Because of the numerous disadvantages of a serumcontaining cell culture, for many years considerable research and development efforts have been undertaken to finally establish cell cultures under serum-free conditions.